One of my resolutions this year is to get more organized and clean my house. How perfect then, that I was selected to review a garage organizing system that was provided by http://www.garagesolutionsrichmond.com. Sadly, this sytem does not actually clean your garage for you. After I recovered from my disappointment, I read the directions to see what it actually does do. As it turns out, the Yard Tool Rack from Monkey Bar Storage is a great way to help you oraganize your own garage or other storage area. The rack installs fairly easily, although we have a cinder block wall in our basement that provided a bit of a challenge. I got ahold of our masonry bits and some plastic anchors and we were good to go. We have a fairly small garage that would only fit the car of a very good driver. We also have a very steep driveway, so we don't actually keep a vehicle in our garage. 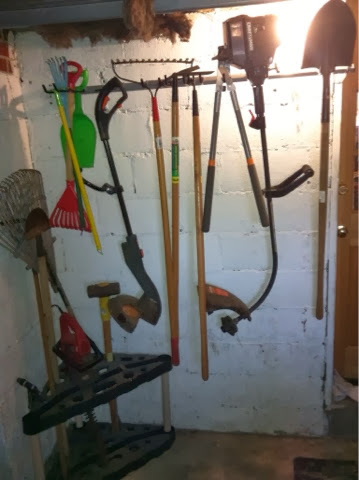 Our garage is used as storage for the kids' bikes, the lawnmower and a host of yard tools. Prior to the installation of our Monkey Bar Storage Rack, we had some of our tools in a triangular tool rack and an old metal trash can. The system wasn't bad, but it got a little jumbled and it took up valuable floor space in our small area. I installed the storage bar on the wall behind the trash can. The instructions are very straightfoward and easy to follow. 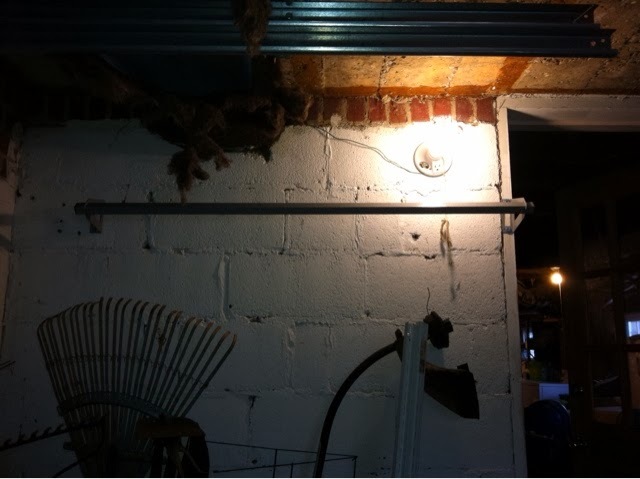 As I mentioned earlier, because of the cinderblock wall, I had to use masonry bits for our drill, but that was the only deviation from the instructions that was required. The hooks are easy to clip on and they slide along the bar wherever you might need them. You can use as many or as few of the hooks as you would like. The kit I was given included one 12" hook, two 3" double hooks, one 3" single hook, one 3" wide hook, two 5" wide hooks, and one J-hook. After installing the bar, I clipped the hooks on and moved the yard tools from the trash can to the storage bar. They hang very nicely against the wall. 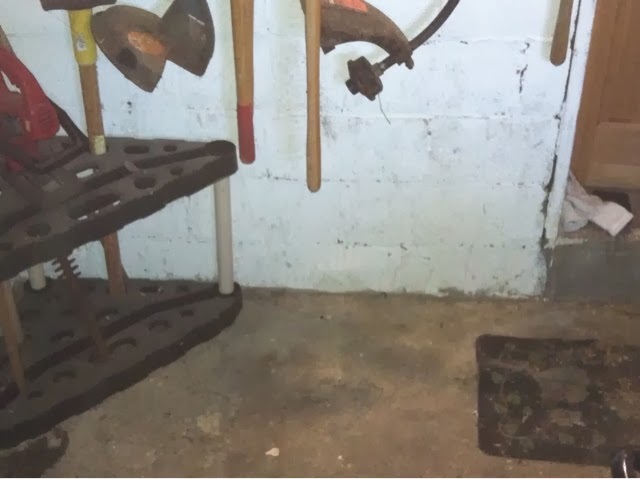 There is a minimal amount of floor space lost under the tools, but it is less than the previous trash can took. This gives us more walking room in the garage. It also keeps the tools from getting tangled up with each other. 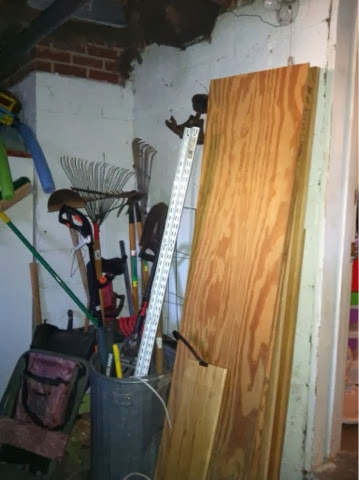 Additionally, the tool end is the part up in the air, so it keeps them out of the way of kids walking through the garage, whereas before the pointy parts were somewhere around eye level to the kids. I'll be completely honest with you, it's January and I have no motivation whatsoever to clean out the entire garage in this cold weather. However, when the weather warms up, I know that having some more floor space in our crowded garage will make it easier to clean out the rest. And being able to easily see which tools are where will allow me to find the tools I need to work on the yard. And the even better news is that I found out I've got enough kid-sized yard tools to leverage some free child-labor this spring. That's legal, right? ?